Hosting JIRA can be easy no matter if you choose VPS, shared Java hosting with private Tomcat or a cloud. We describe and compare 3 methods of installing Atlassian JIRA on our servers. We specialize in Java hosting and JIRA hosting is only one of many Java applications hosted by our clients. Minimal installation will require Xen-768 package but this may only be suitable for testing. You can easily upgrade when your needs grow. For JIRA hosting on shared server (private JVM) you will need a custom package or Tomcat Plus package with heap extension. Contact us for quote. Idle JIRA (installed with WAR method) memory usage is shown below. Installer method is fastest and recommended installation way for VPS. Tarball method allows for reusing existing Java environment (also for VPS) and WAR method allows for reusing existing Java/Tomcat environment e.g. on a shared hosting server with private Tomcat but requires some more manual configuration. We will show 2 methods. Installer method can also be automated and run unattended by preparing response.varfile file. If you have a VPS package then install mail server and MySQL server. 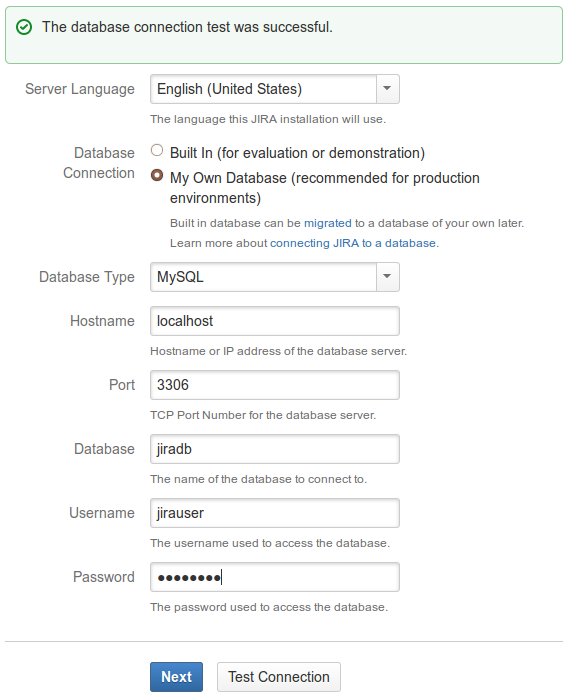 We will use MySQL as our JIRA instance database. You could also use built in database for testing and upgrade to MySQL later but we are preparing production environment in this tutorial so will not bother with built-in database that is for testing only. If you have private Tomcat on shared server with cPanel then create your database, dbuser and mail account in cPanel. Your database and dbuser will have your hosting username prefix (username_dbmane, username_dbuser) in this case. This will install JIRA 6.0.6 on your computer. See where JIRA will be installed and the settings that will be used. Please wait a few moments while JIRA starts up. 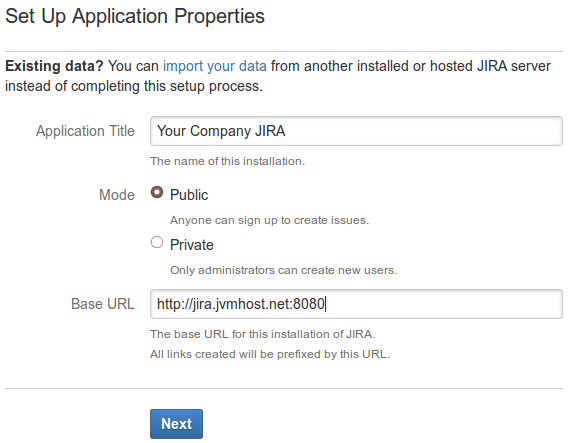 You can then access it with a domain, alias or IP for example http://jira.jvmhost.net:8080/ and run the Setup Wizard. Here are a few screenshots. Now, when you refresh the JIRA Wizard page the warning should be gone. You should also test MySQL connection. Enter your base URL. If you want to skip the port (8080 by default) your can do so but do not forget to also redirect port 80 to 8080 with iptables in /etc/rc.local. This way you will not change anything in Tomcat configuration but get a nicer URL. 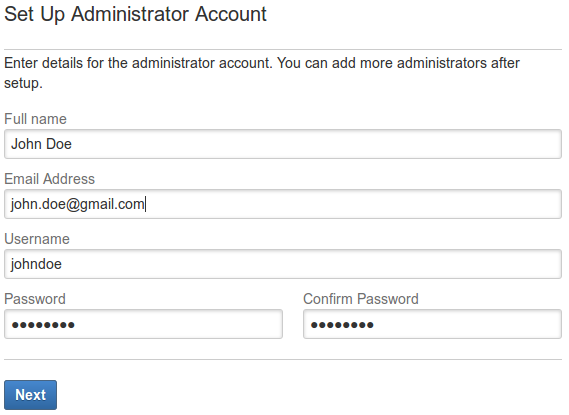 Your will login to JIRA with the administator account you set up in this step. JIRA licenses are paid (currently - Aug 2013 - the cheapest is $10 for up to 10 users a month). You may also get free monthly trial license. 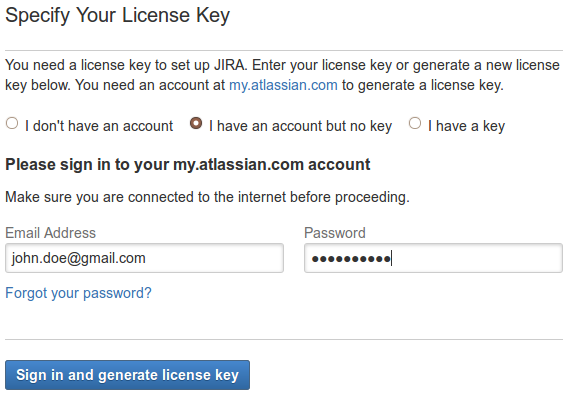 If you do not have a license please register on https://id.atlassian.com/id/login.action then enter your Atlassian username and password in the next step. Your trial license will be automatically generated. If you choose I don't have and account you will be able to register directly from the Wizard and the license will be generated too. In last step configure mail server so that JIRA could communicate with you. In case of VPS the local dedciated mail server will be used as installed previously. In case of shared Java hosting the shared mail server of your Java host will be used. At any time you can also switch to third party mail server like Google Apps. This method assumes there is JDK or JRE already installed on the system. Jira gets unpacked to a home directory of a dedciated user and JAVA_HOME, JIRA_HOME and jira.home variables are manually updated like in previous method. Then you start it as the dedicated user and follow the Wizard. See documentation for more details. You may now customize JIRA's webapp directory content by copying files from webapp/path/to/file subdirectory to the edit-webapp/path/to/file and modifying file in edit-webapp. The edit-webapp version will be used instead of the webapp's one when building WAR. Replace username with your hosting username and create custom jira-application.properties with correct jira.home Java variable. Set mail related properties to comply with RFC 2231 mail clients. Your Heap limit will already be set correctly by JVMHost support to at least 512MB. To have JIRA handle UTF-8 properly make sure URIEncoding="UTF-8" is set for AJP, HTTP (and optionally HTTPS) connectors in server.xml. See also this article. Access Wizard at http://username.jvmhost.net/jira. Create database, database user and assign one to the other with ALL prvileges in cPanel. Use them in the Wizard. The Wizard steps are the same as above. and update ROOT.xml replacing path="/jira" with path=""
For more information about JIRA hosting offer contact our support. For more information on getting started with JIRA, see the JIRA 101 guide.